Cygnus OB2 is a star cluster in the Milky Way that contains many hot, massive young stars. This composite image of Cygnus OB2 contains X-rays from Chandra (blue), infrared data from Spitzer (red), and optical data from the Isaac Newton Telescope (orange). Astronomers would like to better understand how this and other star factories like it form and evolve. 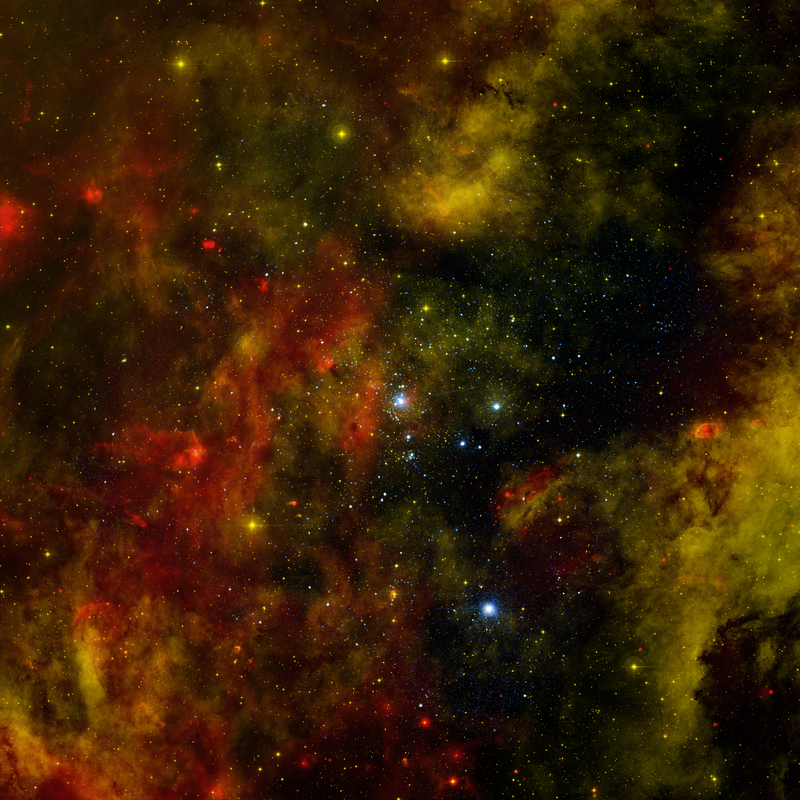 A deep Chandra observation of Cygnus OB2 has found almost 1,500 stars emitting X-rays. The Milky Way and other galaxies in the universe harbor many young star clusters and associations that each contain hundreds to thousands of hot, massive, young stars known as O and B stars. The star cluster Cygnus OB2 contains more than 60 O-type stars and about a thousand B-type stars. At a relatively nearby distance to Earth of about 5,000 light years, Cygnus OB2 is the closest massive cluster. Deep observations with NASA's Chandra X-ray Observatory of Cygnus OB2 have been used to detect the X-ray emission from the hot outer atmospheres, or coronas, of young stars in the cluster and to probe how these great star factories form and evolve. About 1,700 X-ray sources were detected, including about 1,450 thought to be stars in the cluster. 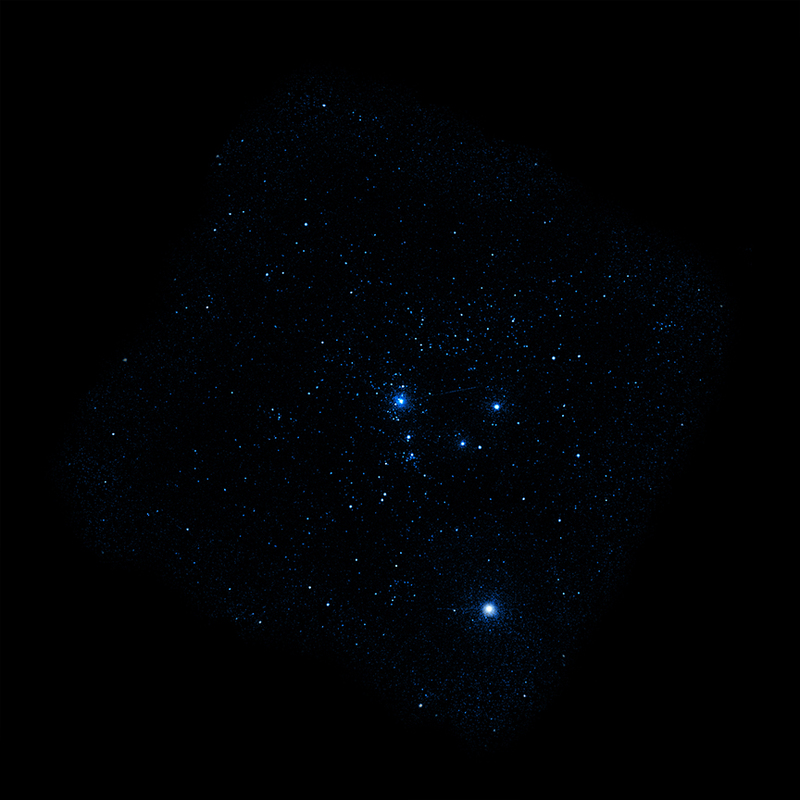 In this image, X-rays from Chandra (blue) have been combined with infrared data from NASA's Spitzer Space Telescope (red) and optical data from the Isaac Newton Telescope (orange). Coordinates (J2000) RA 20h 37m 11.00s | Dec +38° 41´ 52.00"
any longer I think it incumbent on this site to work towards updating it so the wonderful data can be universally accessible. A star cluster that contains many massive young stars. X-rays from Chandra X-ray Observatory with infrared data from Spitzer Space Telescope and Optical data from the Isaac Newton Telescope. In the constellation Cygnus in the Northern Hemisphere.